Twitter allows you to send the number of messages that you want, but with the restriction that only can be 140 characters, including spaces. This technique avoids that have excessive amounts of content, makes summary, interesting, easy to handle and requires users to be more creative. Man can find and make art in anything, and Twitter is no exception. 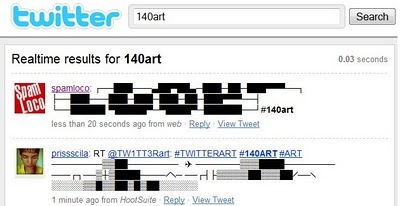 In #140art, you can get several examples of what you can do with a small space, and a limited number of characters. There is also a website called 140art.com, where you can find other designs, and send yours automatically.